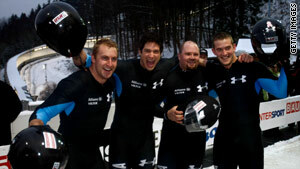 U.S. bobsled pilot Steven Holcomb, second from right, celebrates with teammates after recent bobsled run. (CNN) -- Three years ago, Steven Holcomb was going blind. Today, he's going to Vancouver, Canada, for a shot at Olympic glory. Holcomb is a driver for the U.S. bobsled team. He is one of an estimated 5,000 athletes from around the globe who are traveling to Vancouver, British Columbia, in February to compete in the 2010 Winter Olympics. Only three years ago, the burly Park City, Utah, resident with a buzz cut, couldn't even read the top line of an eye chart. He was suffering from a degenerative eye disease. Holcomb told his coaches his bobsled career was over. How could he drive a bobsled at speeds up to 95 miles per hour when he couldn't even see? But then someone told him about an experimental operation. Holcomb decided to take a chance. By the time of his operation, his vision had become so bad that a nurse had to take his hand to guide him to the operating room. Afterward, though, Holcomb stepped into a new world. "It was like looking at life on high definition TV," he says of the successful 2007 procedure. "I walked outside and I could see the leaves on the trees. It was incredible." Will Holcomb's personal journey end with another incredible sight -- gold for the U.S. men's bobsled team? His story is one of many storylines for sports fans to watch when the Winter Olympics opens February 12 in Vancouver. The games are taking place amid a global recession. But organizers say they expect the usual Olympic extravagance: Five thousand athletes will compete in 86 medal events over 17 days for an estimated 3 billion global television viewers. The city of Vancouver is bubbling with anticipation, says Leslie Bolt, a city spokeswoman. City officials have draped 6,000 Olympic banners around downtown buildings, and local television, radio and newspapers are filled with Olympic chatter. "People who live here are starting to see the city transformed," Bolt says. "We're starting to get the look of the games." The Olympics has special significance this year because Canadian athletes will be competing in front of hometown crowds, Bolt says. "We can't wait to see them shine," Bolt says. "We're feeling great about our athletes. We're supporting Canadian athletes, regardless of how they do." Ron Judd, author of "The Winter Olympics: An Insider's Guide to the Legends, the Lore and Events of the Games," says this year's games open amid a somber backdrop. There's a global recession and even the city of Vancouver struggled to meet its budget. Yet Judd, who has covered six Olympics as a journalist, says all the pre-games worries seems to evaporate once a host country like Canada greets the world during opening ceremonies. "It's amazing to see the passion of the host country," Judd says. "They're in the eyes of the world for the first, and maybe last time." So are the athletes, and the pressure can be enormous, Judd says. Unlike, say, a NFL player who loses the Super Bowl, there is often no next year for Olympic athletes, Judd says. "With the Olympics, it's often a one-shot thing," Judd says. "They've worked their whole life for two or three minutes that can make or break them." National teams feel the pressure, too. Judd expects the typical winter games' powerhouses -- Canada, Germany -- to do well. But he also says the U.S. men's and women's team looks formidable. He says the U.S. team might even surprise people by doing well in events like the biathlon and cross-country skiing. "For the first time, if the U.S. doesn't win a medal in any of those events, it will be an actual disappointment," Judd says. Of course, ice hockey will be a focus for the games. The Canadians are the favorites with their men's and women's teams, Judd says. But there's going to be one new hockey wrinkle this year: The men's hockey games will be played on an NHL-sized rink, which is 15 feet narrower, Judd says. And there couldn't be an Olympics without some kind of controversy. Judd says Olympics officials promised to get more aggressive about going after athletes who dope, but athletes have been trying to beat doping tests for decades, he says. They won't stop trying this year, he says. "Somebody is going to get caught doping again," Judd says. "It always happens." Why aren't the winter games as big as the summer games? No matter what kind of headlines emerge, the winter games don't tend to attract as much attention in the United States as the summer games. Judd says that's because many Americans, except those in regions like the Northwest and the Rockies, don't practice Nordic sports. But in Europe, winter sports like the Biathlon attract huge television audiences, Judd says. "One of the highest rated television events in Europe is the Biathlon," Judd says. "It's like our reality TV." And then there's the problem of intimacy. Winter Olympians, often covered with gear, clothes and goggles, just don't seem as accessible as summer Olympians, Judd says. He says a lot of winter Olympics games end up being "lonely activity on a hill." Every so often, though, a sunny personality can break through the winter Olympic frost. One of those this year may be Julie Chu, a member of the U.S. women's hockey team. She is making her third Olympic appearance. The effervescent Chu is known for being so kind that teammates nicknamed her "Saint Chuey." She also has an intriguing background. Her mother is half Chinese and half Puerto Rican, and her father is from Hong Kong. Chu is the first player of Asian descent on the U.S. national team. Chu says her father promised to get a tattoo if she ever made the Olympic team. After she did, he got a tattoo of the Olympic rings along with Chu's number, 13. Her entire family decided to follow along. Now Chu, her mother, her sister and brother all have the same tattoo. Chu says she's still getting used to her father sporting a tattoo. "It's a little wild," Chu says. "My Dad is a very conservative guy. He went to Cornell [University] as an engineering student. His favorite place is the library." Chu says she expects the Canadian women's hockey team to be a tough opponent. The hometown factor may help them, but it could also be a burden if they don't win a gold, she says. "Anything less than that, they'll hear about it for a long time," Chu says. "That adds a bit of pressure." Holcomb, the U.S. bobsled driver, knows a little bit about dealing with pressure. After contemplating not being able to see for the rest of his life, Holcomb says he's better equipped to deal with Olympic pressure. "If I don't win the gold, it's not like you're going to take me out back and shoot me -- it's not the end of the world," Holcomb says. Just so you know, though, Holcomb is going after the gold in Vancouver. "If I do win, it'll be the second greatest moment of my life," he says. And the first? Holcomb's answer was quick.